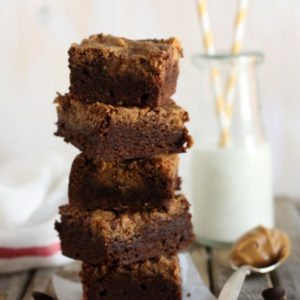 These brownies are a triple threat! They start with a base of melted chocolate, are studded with chocolate chips, and topped with a rich chocolate ganache. Sometimes I go crazy and make claims that I’m not much of a chocolate person. And that is definitely, absolutely 100% not true. Put a pan of brownies in front of me and I’ll show you how much I love chocolate. And these brownies are my fave! 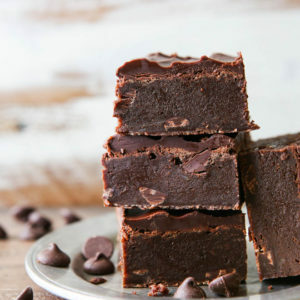 They’re part brownie, part fudge, and completely irresistible. Who can resist an ooey gooey fudgy brownie?? These are the most decadent brownies I have ever encountered, thanks to bittersweet chocolate, times three. Instant espresso powder is an optional addition, but it really helps the flavor. 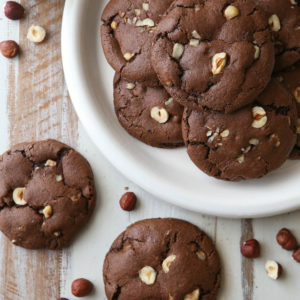 And under-baking them just a tad helps keep them dense with a gooey and fudgy interior. Just the way I like ’em! The recipe has been on my site for a few years, and they’re somewhat famous among my family and friends. Which reminds me, you’ll want to enlist your family and/or friends to help you with these brownies. They’re super rich! And one square goes a long way. Serve them warm (with ice cream!) or cold, you can’t go wrong. And be sure to stash any leftovers in the freezer, individually wrapped, for whenever that chocolate craving hits! 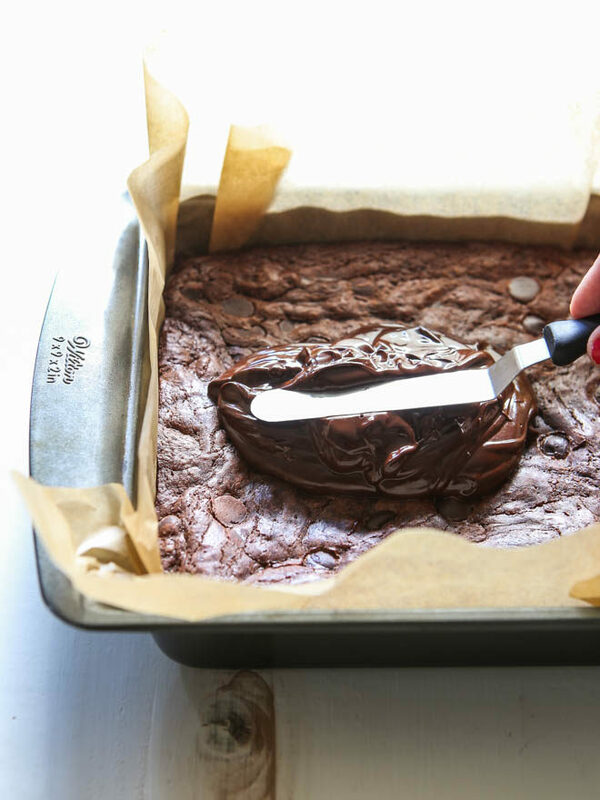 You don’t want to overbake brownies, as they can go from gooey to dry in no time at all. For fudgy brownies there is no specific indicator of doneness, so the best bet is to rely on time and temperature. But you can also look for the edges to pull away from the pan slightly, and the surface will crackle softly. 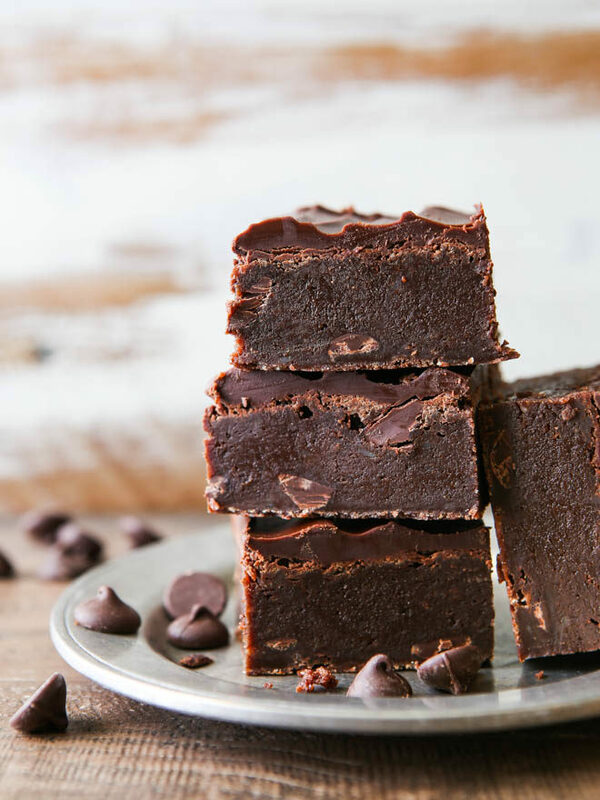 Fudgy brownies packed with chocolate chips and covered in rich ganache icing. Preheat oven to 325 degrees F. Line a 9-inch square baking pan with parchment paper. In a medium saucepan set over low heat, melt the butter and chocolate, stirring frequently. When melted and smooth, remove from heat and stir in the sugar. Add the eggs one at a time, mixing after each. Stir in the vanilla and espresso, if using. Gently stir in the flour and salt, stirring only until streaks of flour are almost gone. Stir in chocolate chips. Pour batter into the prepared baking pan. Bake until edges are firm and dry, and center is set but not dry, about 35-40 minutes. Let cool completely. Place the butter and chocolate in a glass bowl set over a pan of barely simmering water. Stir frequently as mixture melts. When smooth, remove from heat and let cool for 10 minutes. 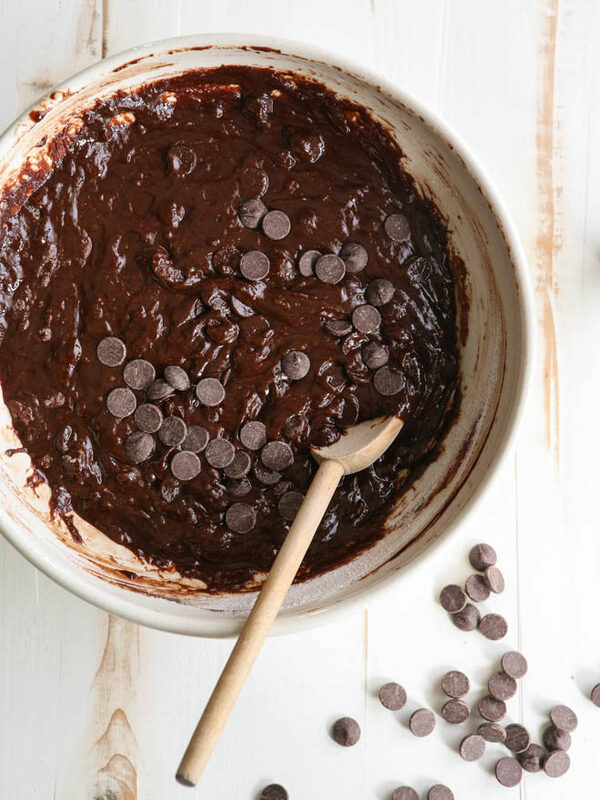 Pour onto the cooled brownies and use a spatula to spread it evenly. Chill in the fridge for 1 hour before serving, for best results. For clean slices, wipe knife clean with a warm wet towel in between each cut. For easy removal from the pan, line with parchment paper so there's enough on the sides to use as a handle. Then once they're cool, simply lift and transfer to a cutting board for slicing. Store individually wrapped in the freezer for easy snacking. Recipe originally published January 2014. Its like you read my mind! I need a new brownie recipe and then I come here! Thanks for sharing. My goodness! These are going to be impossible to resist. They sound and look wonderful and I can’t wait to try them! It sounds as if I need to stock up on chocolate – and plenty of it!! Oh wow! These look fantastic. The topping is almost too glorious to describe! I am completely in love with brownies right now, so I have try your version of these triple choc beauties. Wow!! 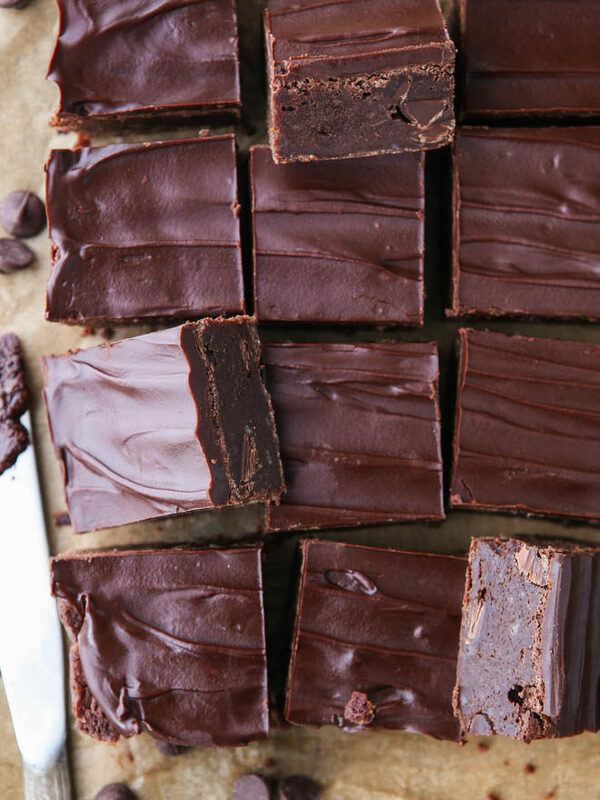 These brownies are my inner-chocolate-lover’s dream come true!! This brownies look straight up perfect!! Yum! Chocolate times 3??? Sign me up, I’m an admitted chocoholic, and I would just inhale these! I can honestly say I have never had a better brownie. Never. They were amazing. I am hereby requesting a pan of them for my birthday. Along with homemade ice cream (flavor to be determined at a later date). And the coconut cake. And strawberry rhubarb pie. Simply amazing my dear. Simply amazing. Happy Birthday Steve!! 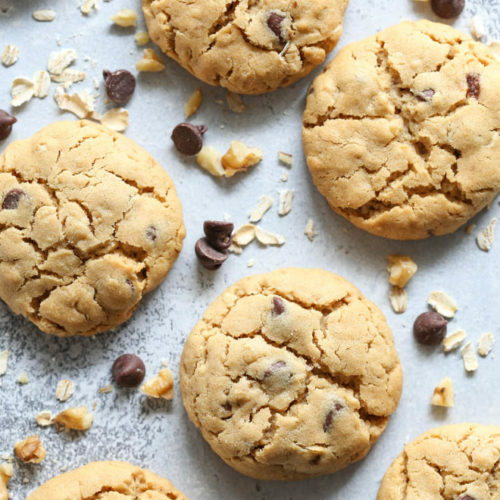 could i leave out the extra chocolate chips? Can I confess to you that I’ve never made brownies from scratch? I’m thinking these gorgeous brownies should be my first attempt. Thanks for the recipe! Hoh! Not a chocolate person! It sounds like English, but I just can’t make sense of it. Glad you cancelled that out with this glorious thing. These brownies look incredible! Nothing like a rich, chocolatey brownie! As always your finished product looks fantastic. I envy your photo skills. Thank you for another recipe to try out. your brownies looks tempting..If I reduce the amount of sugar from 1 1/2 to 1 cup, will it effect the taste and texture of brownies? cos I love chocolate, but not too keen on it being too sweet..
You shouldn’t notice any effects, though I couldn’t say for sure since I haven’t tried it myself. These look delicious! I must try these some time. 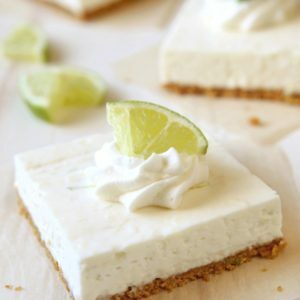 I’ve been the official baker for the weekly “Game of Thrones” viewing with my boyfriend and his best friends the past few weeks – this recipe was a hands-down favorite!! The brownies were perfectly rich and gooey, and the ganache was the richest, chocolatey-est treat on top. Thank you for an incredible (completely delicious) inspiration!! So yeah, I made these yesterday and I’m sorry but I did not like them. Hated them actually. Because they put every single brownie that I’ve ever made in my life to absolute shame! My God, these things are amazing. Thanks for making me feel like junk as if I never had business making brownies before. Also thanks for finally giving me a go to brownie recipe. Made these for a Super Bowl party tonight and they were a huge hit! I thought I had great recipes for brownies but yours knocked everyone out of the ballpark. Thanks for an absolute winner. Yay! Love to hear that, thanks!